When your floor is made up of stone, it’s easy to assume that nothing can damage it. After all, stone is an incredibly hard substance that generally requires specialty tools to cut it. Everyday wear like your dog’s nails clacking against the floor and your hard soled shoes walking across it aren’t going to be enough to damage it — right? There is no easy, blanket answer. The relative hardness and durability of your floor will depend on what type of stone was used. For example, limestone is a porous stone, so if it isn’t properly sealed (and resealed every so often), everyday grime can get into the pores and cause the stone to wear away. Liquids can also seep into those spaces and weaken your stone flooring. Even a harder stone, like slate, isn’t totally impervious to damage. Slate is more dense, so it’s much more resistant to damage from liquids — which is why it’s often used in kitchens, bathrooms, and for outdoor patios. However, it is still susceptible to damage if the tiles aren’t properly cared for. No matter what type of stone flooring you have, it’s going to need more than just the occasional sweeping or mopping to keep it in great condition. 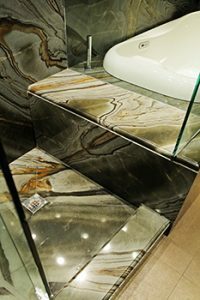 Keeping your stone or marble floors well maintained, not just clean, will help prevent restoration needs down the road. To start with, please don’t stop sweeping and mopping. This everyday care does help keep your stone and marble flooring in good shape. Dirt, grime, sand, and other gritty substances get tracked into your home daily — yes, even when everyone removes their shoes at the door. Those small particles might not seem like a big deal, but they can cause plenty of damage over time. Things like sand and dirt are abrasive, so leaving those particles to hang out on your flooring will wear away the surface layers. This means grit is wearing away the sealant more quickly, if your stone floors have been sealed. It also means that your floors will show wear and tear in high-traffic areas more quickly because those particles are abrading against your floor every time someone walks across them. So, first steps first, make sure you’re regularly sweeping and mopping with the appropriate cleaner for the type of stone you have. A multi-purpose stone flooring cleaner will get the job done well enough for everyday use; just make sure that multi-purpose cleaner specifies that it works for the type of stone you have. The other part of regular care is to make sure you clean up spills and messes as soon as possible. Not only can colored liquids potentially stain your stone, but leaving messes on your floors can contribute to wear on the sealant and stone. This is especially true for acidic liquids like lemon juice or vinegar or ammonia-based cleaners. The faster you clean up spills and messes, the less likely your flooring is to be damaged. The other key element to keeping your stone flooring in great shape is to invest in occasional stone or marble floor cleaning performed by a professional floor cleaning service. Professional floor cleaning services generally involve a multi-step process which cleans and protects your flooring. Better still, the cleaners used will be tailored to your flooring type and the care your floor needs. Stone and marble floor cleaning will provide care to the grout between stones as well as the stone itself. Then, once your floor has been properly cleaned and polished, we’ll apply a colorless protective barrier by way of the appropriate stone sealant. Most types of stone flooring, marble included, are porous enough that they often need to be sealed for increased protection. These specialized stone floor sealants help prevent liquids and small bits of grime from getting into the pores of the stone and wearing it away. However, sealant gets worn away over time, so you’ll need to have your stone floors resealed. How often you need to reseal your floors will depend on your stone flooring and the type of sealant. 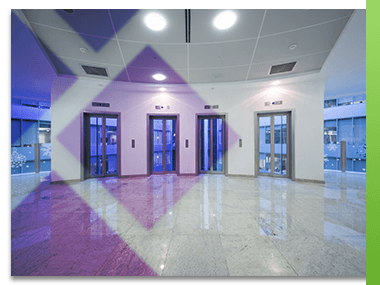 Some options only last around a year, while some solutions are designed to last two years on up to five years, as long as the floors are properly maintained. Moldy grout – if you’ve noticed mold slowly spreading along cracks or lines in the grout, the sealant protecting your grout isn’t doing its job anymore. You’ll need to check with a professional floor cleaning service to get rid of that mold before resealing it. Scratches, etching – stone floors are pretty hard, so if you’re noticing an increase in dullness or scratches, it’s probably time to have your stone floor polished and resealed. Staining – this is a pretty clear sign your sealant is failing. If there are visible stains that you can’t get up just from mopping, your stone floor will probably need the help of professional floor cleaning services to nix any stains before resealing it. If your floors are showing any of these signs, contact your San Antonio floor cleaning service. The Steam Master Cleaning & Restoration team is here to help! The condition of your stone and marble matter. With many cleaning products readily available to you, you may wonder why you should hire professionals to clean your marble and stone for you. While these product labels promise superior results, many times the chemicals they are made with can actually cause your beautiful surfaces more harm than good. 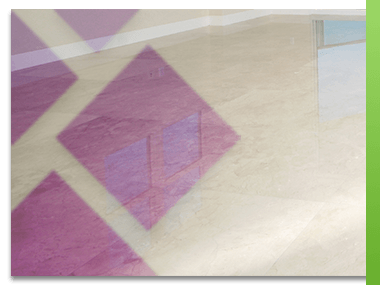 If you are seeking professional marble floor cleaning or stone tile cleaning services in San Antonio, talk to our technicians about the difference our floor cleaning services can make. The last thing we want to happen is for you ruin your stone and marble when you could have just hired us to take care of all the cleaning for you. At Steam Master Cleaning and Restoration, our goal is to provide you with the floor cleaning service you are looking for and results that exceed your expectations. Your marble and stone are made to look outstanding, and with us, that is exactly what we will help you achieve. We understand what your stone and marble mean to you. With Steam Master Cleaning and Restoration, you get an experienced staff that is dedicated to ensuring your satisfaction with our stone tile or marble floor cleaning. Using only the highest quality cleaning products and techniques that are proven to work, you can trust that your stone and marble are in the best hands. Through our high value, integrity, and customer service, you can count on our team of professionals to be there when you need them most. No matter how big or small the job at hand may be, we take care of all the cleaning for you. To schedule your floor cleaning services appointment, or to get your Speedy Fast™ Bid, contact us today!